for the measurement, control and regulation of gases and fluids takes more than just combining individual valves or controllers. 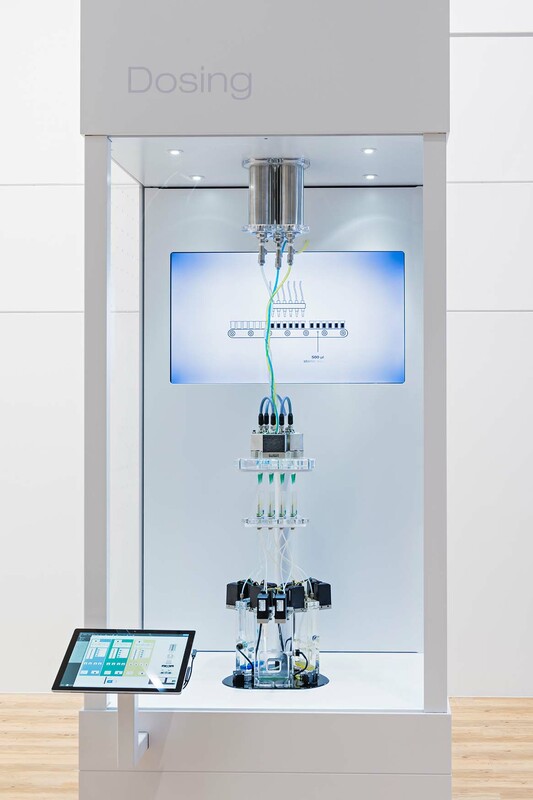 This is why at this year's COMPAMED, fluidics expert Bürkert (see press release) will be focusing on systematic approaches, showing how tailored solutions can be created at reasonable cost with know-how and creativity. 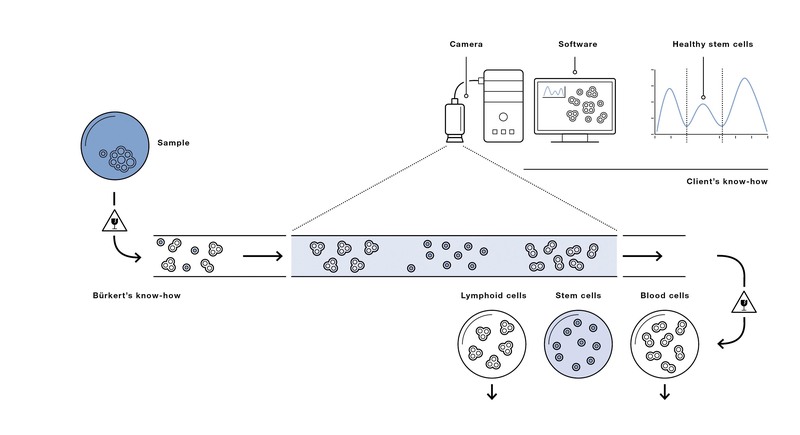 will be an “application machine” (Image 1), which unites from the fields of stem cell research and aseptic filling, solved with the same technology: In both cases, microvalves play a key role along the corresponding controller. 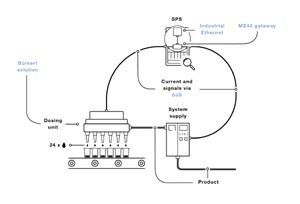 Such application solutions along with other “tailored” solutions are developed in Bürkert’s Systemhaus institutions in Ingelfingen, Dortmund and Dresden as well as in Charlotte (USA) and Suzhou (China). Together they form an international engineering network that understands the needs of their respective markets and satisfy them with expertise. The two applications “stem cell research” and “aseptic filling” both require precise dosing of minuscule quantities (Image 2). This process enables lymphoid cells, stem cells and blood cells to be separated from one another for the first time without accidentally influencing the nature of the cells. The fluidic system solution developed by Bürkert made a key contribution in this regard. 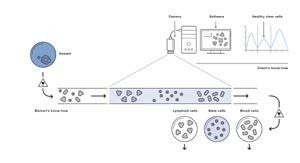 It was also possible to apply the experience from the non-destructive filling of stem cells to the filling of aseptic packaging (Image 3). In this case, many small containers are filled with 500 microlitres of sterile fluid prior to sealing in order to protect the delicate product contained within. 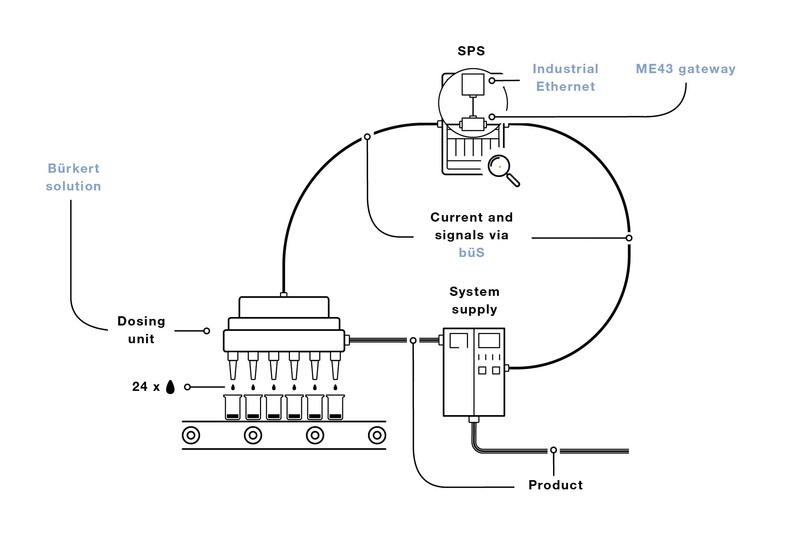 The compact solution developed by Bürkert reduces the complexity of the process while also improving efficiency, because the dosing unit is now only connected to the controller via a single bus line; the supply of medium now also only requires one line.